The players select a s tarting player using any method they want. He takes the governor placard. Place the 5 role placards next to each other in the middle of the table. Shuffle the 5 trading house tiles face down and place them in a stack face down next to the trader placard. one Indigo plant card (sorted out from all the cards), and places it face up in his play area (the area before him on the table) as his first building. 4 face down card s from the card supply (after shuffling it), and takes them in his hand, keeping them secret from the other players. Place the remaining cards as a face down card supply next to the role cards. Opposite them will be the discard stack. Place the scoring pad and pencil to the side during the game. They will be used at game end to record players' victory points (VP). The game is played over several rounds (usually between 11 and 14 rounds). Each round runs as described below. The governor (the starting player ) begins. He takes one of the role placards from the middle of the table, places it face up in his play area, and takes the action associated with this role. Next, his left neighbor takes the action associated with the role, and so on, clockwise around the table, until each player has taken the action once. Now, the left neighbor of the governor takes his turn. He selects one of the remaining role placards from the middle of the table, places it face up in his play area, and takes the action associated with the role. Next his left neighbor takes the action associated with this role, and so on, clockwise around the table, until each player has taken the action once. When all players have selected a role and the players have taken the actions associated with those roles, the round ends. 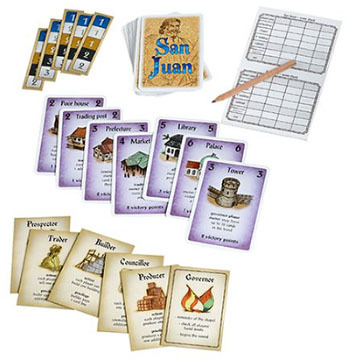 The players return the used role placards to the middle of the table and the left neighbor of the governor takes the governor placard, becoming the new starting player. The new round begins with the new governor selecting a role placard, and so on as before. Note: when playing with just 2 players, the governor selects a second role (with both players taking the associated action) after his opponent has selected a role and both have taken the associated actions. Then the round ends and the governor changes. 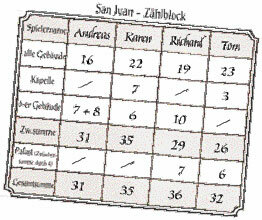 Thus, with two, 3 of the 5 roles are chosen: governor - opponent - governor. 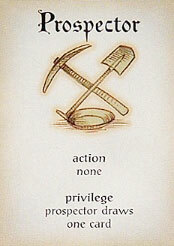 Each role has an associated action (phase) for all players, taken in clockwise order, and a special privilege only for the player who selected the role (exception: prospector). 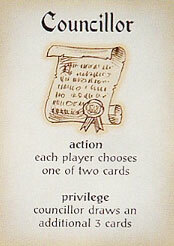 The player selecting the role is the first to take the associated action. The other players follow in clockwise order (for speed, some actions may be taken simultaneously). 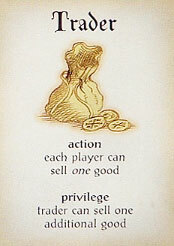 A player must select a role on his turn. He may, however, choose to refrain from taking the associated action. The other players may then take the associated action or refrain from it as each chooses. 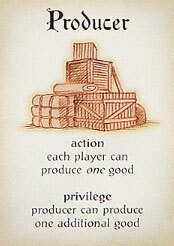 A role placard, once chosen, remains in the choosing player's play area until the end of the round. No other player may select this role in this round. The player, who chose this role (i.e. 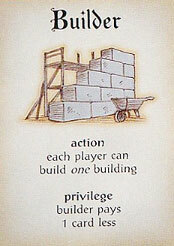 the builder), may build any one building by placing the card representing the building from his hand face up in his play area, where it remains for the remainder of the game. Then he must pay the building cost (shown on the card in the upper left and right corners) by discarding cards from his hand equal in number (not value) to the building cost (see right). The special builder privilege allows the builder player to reduce the building cost by 1 card, but not below 0. Next, the other players, in clockwise order, may each build one building as above, but without the privilege. A player may build any number of the same kind of production building, but only one of each violet building. 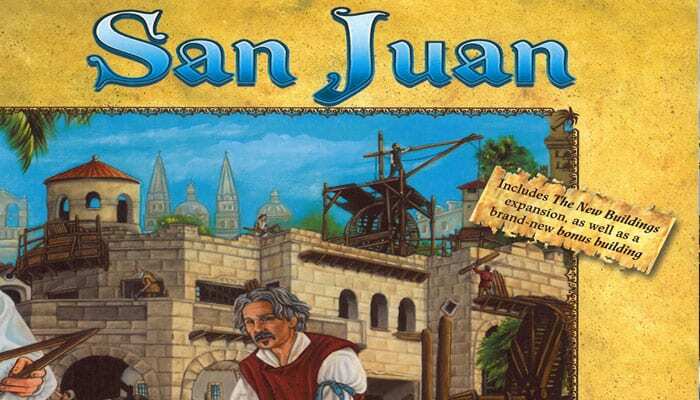 Notes: The special functions of several buildings may allow a player to alter these building rules if he has the building in his play area when he builds. These include the smithy, the crane, the poor house, the black market, the carpenter, the quarry, and the library. A player may not reduce his building cost below 0, such that he takes cards instead of discarding them. Example: Ken is the builder (-1 from building cost) and has the smithy (-1 from production building cost) and library (double privilege = another -1 from building cost) in his play area. He chooses to build a sugar mill (normal cost is 2) and pays nothing. He would normally get a reduction of 3, but he only gets a reduction of 2 as he cannot reduce the building cost below 0. The player, who chose this role (i.e. the producer), begins the goods production. He takes one card from the card supply and places it face down, without looking at the face up side, on any one of his empty (i.e. where no card already lies) production buildings (see figure at right). He then may use his privilege to place one other card from the card supply on any one of his other empty production buildings, as above. Next, each other player, in clockwise order, places one card from the card supply on any one of his empty production buildings, as above. If a player has no empty production buildings, he produces no goods in this round. Such cards represent produced goods that may later be sold in the trader phase. Players place the cards face down so they overlap the production buildings. Note: The special functions of several buildings may allow a player to alter these production rules if he has the building in his play area when he produces. These include the well, the aquaduct, and the library. The players may choose to take their actions simultaneously as there is no need for the actions to be in clockwise order. The player, who chose this role (i.e. the trader), turns over the top-most face down trading house tile. This determines the price the players get when selling their goods. Then he announces which of his goods he will sell. He can sell one good (card) as his basic action and other one other good as his privilege. He takes the named goods (cards) from the corresponding production buildings and places them face down on the discard stack without looking at the face up sides. Then he draws cards from the card supply equal to the prices of the goods he sold and adds them to his hand. Next, each other player, in clockwise order, may sell any one of his goods for the price shown on the face up trading house tile, as above. As his last action, the trader places the face up trading house tile face down under the stack of trading house tiles. Thus, the order of the 5 trading house tiles does not change during the game, giving players with good memories possible knowledge of upcoming trading house tiles. 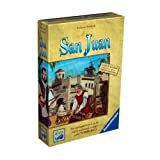 Note: The special functions of several buildings may allow a player to alter these selling rules if he has the building in his play area when he sells. These include the market stand, the trading post, the market hall, and the library. The players may choose to take their actions simultaneously as there is no need for the actions to be in clockwise order. Example: Alfonzo is the trader and he has a market stand and a trading post in his play area. He turns over the top-most trading house tile. He announces that he will sell 3 of his goods (1 as the trading action, 1 as the trader privilege, and 1 for the trading post). He takes the good (card) from his indigo plant, his tobacco storage, and his silver smelter and places all three face down (without looking at the face up sides) on the discard stack. Then he draws cards from the card supply equal in number to the sum of the prices for the 3 goods sold: 1 card for the indigo, 2 cards for the tobacco, 3 cards for the silver, and also 1 cards for the market stand, and adds them to his hand. Next, the other players sell their goods. The player, who chose this role (i.e. the councillor), takes 5 cards from the card supply (2 cards as the action and 3 more cards as the privilege), looks at them, and adds 1 to his hand, discarding the other 4 face down on the discard stack. Next, each other player takes 2 cards from the card supply, looks at them, adds 1 to his hand and discards the other face down on the discard stack. Note: The special functions of several buildings may allow a player to alter these councillor rules if he has the building in his play area. These include the archive, the prefecture, and the library. The players may choose to take their actions simultaneously as there is no need for the actions to be in clockwise order. The player, who chose this role (i.e. the pros pector), draws 1 card, adding it to his hand as his privilege. There is no action for the other players associated with this role. Note: The special functions of several buildings may allow a player to alter these prospector rules if he has the building in his play area. These include the gold mine and the library. After each player has chosen a role and the players have taken the associated actions and privileges, the round ends. Players return the used role placards to the middle of the table. The governor's left neighbor takes the governor placard, becoming the new governor. The new governor reminds the owners of the chapels that each may place 1 card from his hand face down under his chapel. Next, the governor counts the cards in each player's hand (including his own). If a player has more than 7 cards in his hand*, he must place the extra cards face down on the discard stack. The player may freely choose which of his cards to discard. Exception: the owner of a tower may have up to 12 cards in his hand. Finally, the governor begins the next round by selecting a role card. The round continues as before. For clarification: during a round, a player may have more than 7 cards (12 with a tower) in his hand. The hand card limit is only imposed at the beginning of each new round. 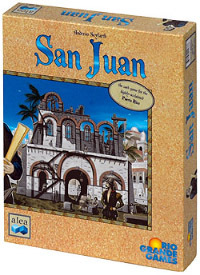 The game ends immediately after the builder phase, if at least one player has twelve buildings in his play area; the round is not played to the end of the round. the victory points for the palace (really at the end). The player with the most victory points wins the game. If players tie with the most victory points, the player among them with the most cards in his hand and on his production buildings is the winner.